Available from TFC, the MD series enhanced range of variable molded inductors, used in FM radio, satellite receiver, car navigation system, CATV and cable TV applications, with a choice of core materials; carbonyl, aluminium, brass and ferrites, offering high temperature stability. 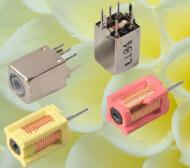 These variable molded inductors can be supplied shielded or unshielded. These variable molded inductors offer a very wide inductance range and multiple choice of model size and frequency of operation. When using ferrite or carbonyl cores, the minimum inductance is measured with the core in a mid position within the bobbin. When using aluminium or brass cores, the inductance max. is measured with core half way out of the bobbin. TFC provides European distribution and a Head Office for group manufacturing facilities supporting and managing the resources of three companies. Manufacturing includes High Precision Quartz products for resonators, QCM, Material Lapping and Polishing, Precision OCXO, TCXO and VCXO oscillators and Frequency Standards. Distribution provides an extensive range of Inductive Components with Air Wound Coils, Moulded Coils, Chip Inductors, Screened and Moulded r.f. Coils, smd Power Inductors, Toroid Coils, Noise Suppression Modules and Ferrite beads. A select range of Miniature smd Clock Oscillators, TCXO and VCXO are also provided to complement the manufactured range.The companies have Integrated Management Systems and hold registrations to ISO9001: 2008, ISO14001: 2004, IPC J-STD-001, Investor in People and are RoHS compliant.